A call to Steve Reoch at All Ocean Yachts brings news that he's signed the 64m explorer yacht Atlantis II for sale. Famed for her exploration of the Titanic shipwreck, Atlantis II has just completed a major refit which included servicing and upgrading of all systems and equipment. Seven decks include a top deck skylounge with a bar, 42” flat screen TV, numerous sofas and a piano. The dining room has a fireplace and seating for 30. There is a conference room, and the ship is equipped with telephone, Internet, fax and satellite TV systems. 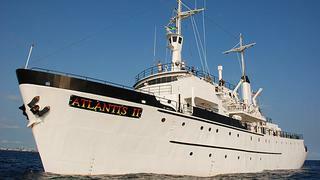 Atlantis II has 32 staterooms, most of which have a private en suite bathroom with shower. There are various configurations of double or single staterooms, and also bunk rooms for crew. 16 of the staterooms have been fully renovated, and 16 have been stripped, resurfaced and are in the process of being completed. Available to view in South Florida, Atlantis IIis asking $4,950,000.